The Brick House...in pursuit of stronger lives. 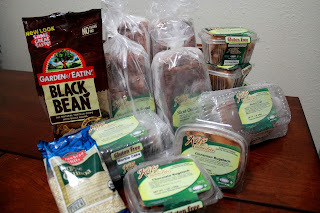 : Who said that you can't save $$ at the Healthfood Store? Who said that you can't save $$ at the Healthfood Store? The first Tuesday of every month is Rainbow Tuesday at Debbie's Health Foods and you get 20% off all regular priced items and there are also many additional items that have been reduced up to 75% off! When I reviewed Katz Gluten Free yummies and gave them a recommendation to sell at Debbie's, they (Katz) kindly gave me a $50 certificate for any Katz items at Debbie's. So, armed with my certificate, I was determined to make this work for me! Check out what I got for $2.32! I saved $57! My God Provides! Even without the $50 certificate, I would have done really well. So...I made a mistake of going to the store hungry, and the Black Bean Chips were 75% off at only $1.00 so I caved...and only a portion of them made it home. :-) The main reason I went to Debbie's it to get my favorite grain. Quionoa! I love quinoa and few stores carry it, however Debbie's is definately the cheapest place to get it on Rainbow Tuesday. The regular price is $5.49 but with the 20% off it is only $4.39! Publix sells a box of it for around $6 so as you can see it is almost a $2.00 savings. It is the only grain that is more protein than carbohydrate and is a great substitute for rice in many dishes. It is similar to the texture of couscous and can be used in any dish that you would use couscous. Look for it in healthfood section of your grocery. It is prepared using the same water to grain ratio as with rice. Season with olive oil, garlic and salt & pepper. Yummy! Go get you some!